China is not the only Asian nation that needs Bibles. Christians in many other Asian counties have an enormous need for God's Word. They face a nearly impossible situations to get their own copy of a Bible due to government opposition, remote location, economic obstacles, or (usually) some combination of all three. Biblia Global works with local contacts, pastors, missionaries, and partner orgtanizations to give a Bible to these Christians. Each Bible costs between $3 and $8 to print. The more we can print, the less each Bible costs. While we cannot share the details and locations of all our work due to security concerns, we are able to offer encouraging stories and details when possible (click on the project links to the left to learn more). Many of the Asian believers Biblia Global serves belong to persecuted minority people groups whose identity and ethnic makeup transcend national boundaries. For example the Hmong are spread over the mountainous regions of Thailand, Laos, Myanmar, Vietnam, and China. With a total estimated population of 9 million, the Hmong have been particularly responsive to the Gospel, but also face heavy persecution. 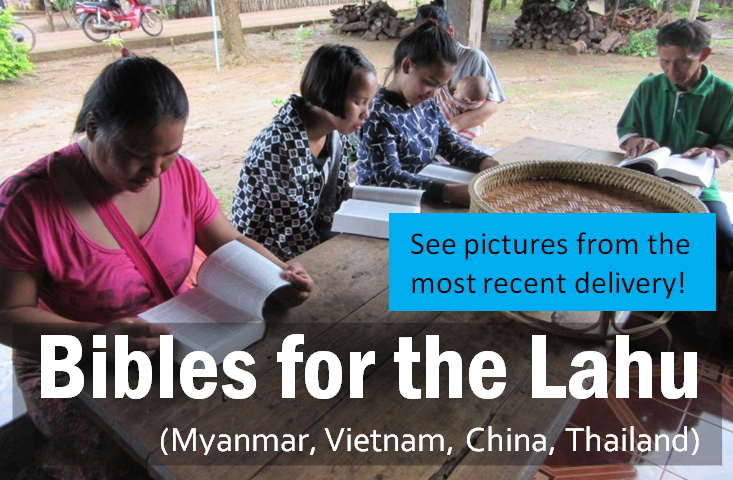 The need for Hmong Bibles is significant, and persecution is strong. In one province of a restricted nation, the Hmong Christian population is estimated to be 60,000 people, with only 10,000 Bibles. That's one Bible for every six people. To illustrate the importance that God's Word makes for ethnic groups like the Hmong, one of our contacts recently shared that when the Bible gets into the village the whole village stays with Christ. Without the Bible, those who give their lives to Christ give into pressure from surrounding villages and turn away from the faith. God's Word is a big deal for these persecuted minorities and makes a measurable impact. The evangelists have sown the seeds of the Gospel in the far reaches of Asia to people groups like the Hmong, Khmu, and Chin. The church has been planted and teams have worked for a generation to translate the Bible into these minority languages. But the job is not finished yet! God's people now need the physical Word of God in their hands. We as the western Church can't drop the ball and leave our brothers and sister in Christ without the fundamental resource to grow as a Child of God: a Bible. Your gift to Biblia Global and our Bibles for Asia Project will pay for the printing and delivery of Bibles to our Asian brothers and sisters in the hardest to reach places of the globe. Printing costs are usually $3 - $8 per Bible and transportation cost are roughly $1 per Bible*. We also have a limited number of Bibles available for believers in North America in some of the ethnic minority languages listed above and more. Please contact us for more information. Photo: Chin Christians wait to receive their Bibles. Photo: Lahu Christians receive thier Bibles. *Your gift to Biblia Global and our Bibles for Asia Project will pay for the printing of Bibles to our Asian brothers and sisters in the hardest to reach places of the globe. Unfortunately we cannot preference gifts to a people group's Bible printing; we instead pool the money given to the Bibles for Asia Project to fund the next Bible printing for Asian tribes in greatest need of Bibles. Printing costs are usually $3 - $8 per Bible and transportation cost are roughly $1 per Bible.